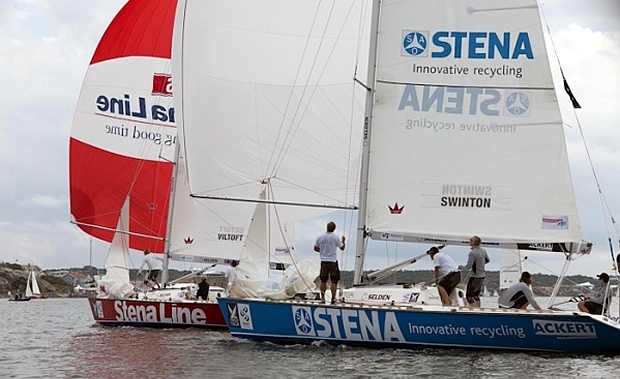 It was the Australian duo of Peter Gilmour and Keith Swinton who dominated the headlines on day two of Qualifying at Stena Match Cup Sweden – but for very different reasons. After eight flights of racing it was young Swinton of Black Swan Racing who emerged as one of the form sailors with three straight wins in tricky conditions boosting him up to the business end of the standings. But it was disappointment for Peter Gilmour of Yanmar Racing who wound up at the bottom of the table after failing to bag any wins in what was a frustrating day for the four-time World Champion match racer. Torvar Mirsky of The Wave, Muscat, the third Australian competing on the waters of Marstrand Fjord, overcame yesterday’s defeat by local skipper Johnie Berntsson to add three wins to his tally, suffering only at the hands of Portimao Portugal Match Cup winner Ian Williams of Team GAC Pindar, the day’s other stand-out skipper. Buoyed by a win over New Zealand's Phil Robertson in day one of qualifying yesterday, Swinton came out firing this morning with a dominant display against Match Race France winner Damien Iehl, winning the start and commanding the left side of the course. There was no catching Swinton who opened his scorecard for the day with a big win over his French rival. The starts were key to Swinton’s success, bossing opponents Dane Rasmus Viltoft and Portugal's Alvaro Marinho around the box in the pre-start sequence to gain the upper hand in both races. Victories against both teams shot Swinton to the head of the leaderboard after eight flights, with 13 more to sail. It couldn’t have been a more different story for Peter Gilmour, who after eight flights had failed to score a win from four matches. Gilmour, currently lying second in the overall World Match Racing Tour standings behind Italy's Francesco Bruni, suffered successive defeats to Mirsky, Marinho, Mathieu Richard and Swede Mattias Rahm of Stena Bulk Sailing Team.